Accurate value depends on accurate judgment of condition. The art of grading old nickels by evaluating their condition eliminates the possibility of under estimating the value of your coin. 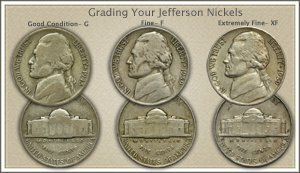 Collectors and dealers always evaluate the condition of every old nickel, assign a "grade," and then place a value. You can do the same. Notice the date on the Buffalo nickel, any improvement in clarity and boldness; result - value of the coin immediately doubles or more. 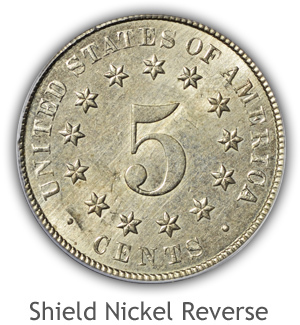 Shield Nickel: First of a new five cent coin was introduced with the Shield Nickel in 1866. Holding the title as a "first" these nickels are popular with collectors. Dates and condition are deciding factors to value. One prominent feature of the design is the shield and if any of the fine horizontal and vertical lines on your coin show, collectors are interested. Liberty Nickel: A popular series with a bold design of Liberty. After the date and mintmark is determined turn your attention to the crown in Liberty's hair. If the lettering "Liberty" is visible it is a better than average coin. Slightly more detail visible and the coin becomes a solid collectable grade. Nice even color without dark areas enhances desirability. 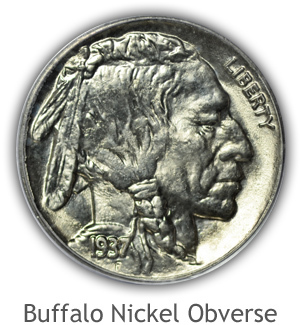 Buffalo Nickel: Here is one of the iconic designs of all US coin series. 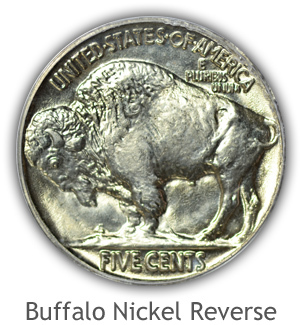 More collectors are assembling sets of Buffalo nickels than any other nickel series. With the high relief design and maintaining a stunning look even when worn; values are stable. 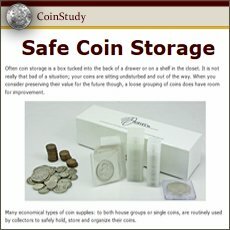 Follow along with the video, then compare your coins to the images, become confident judging the condition of Buffalo nickels. 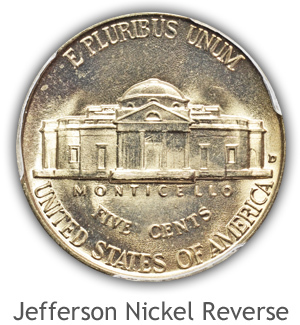 Jefferson Nickel: Judging the difference between circulated and Mint State Jefferson nickels is a necessity. It is where the value difference accrues. Attention is given to the steps necessary determining the Uncirculated (Mint State) grade. A magnifying glass 5x power is helpful. Grading old nickels involves judging the presence or absence of details to the surface of the coin. If a coin is worn, missing detail is noted and the severity of the removal is judge to arrive at a grade. Knowing the full original design including the intricate details is needed to accurately grade a coin. View the mint state-uncirculated coins noting the finer detail. 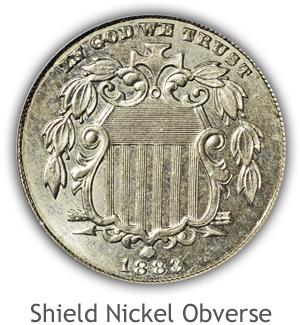 A well detailed shield is central to the obverse design of the Shield nickel. Curving framework borders the shield. This framework on a mint state graded nickel is higher in the centers and tapers to raised border edges. Within the shield are fine horizontal lines at the top. Each line is rounded in profile and separated from each other. Vertical columns in the center of the shield are detailed with raised lines also, each line distinct. Difficult to fully strike, these nickels are occasionally found with the lines in the shield merged and not fully separated. The top right area is most prone to displaying a weak strike. Surrounding the shield is an olive branch. Grading nickels examines and confirms the olive leaves retain the raised edges from the lower relief centers. Also, the design of the leaves includes a central line in the leaves. A large numeral "5" dominates the reverse. Height of the five's profile was intended bold from the field, however on some weak struck coins the five is low in profile. Thirteen stars encircle the large five. Six points of the stars are defined by lines meeting in the raised center. Grading judges these stars for wear and must understand flat areas are often the result of soft striking of the coin. 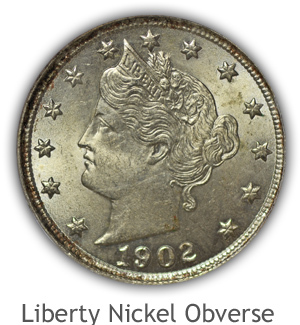 Liberty's hair is full of detail on the Liberty nickel. Flowing waves of hair are high and lower in relief as they extend from the forehead to back of her neck. A well-defined hair knot is also full of finer strands of hair detail. Six pointed stars surround Liberty's portrait. 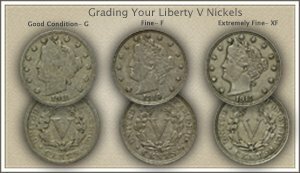 Grading the Liberty nickel takes into consideration some weakness of full detail within the stars cause by striking problems. Actual wear removes luster and results in a smooth dull surface. Detail of the cornet starts with "Liberty" inscribed with a raised rim above and below. An arrangement of wheat grains and cotton blossoms are above the cornet. Fine detail on a mint state grade is seen in the roundness of the grains wheat and finely textured blossoms. Leaves of the blossoms are raised along the edges giving depth to the design. Edges of the leaves are one of the first to wear and are closely inspected when grading. The large Roman numeral "V" indicates the denomination of the nickel and is sounded by a bold wreath. Ears of corn with fine kernels form the base of the wreath with cotton blossoms extending above and ending with wheat stalks at the top. All elements of the wreath are highly profiled with raised and lowered areas. Fine lines complete the designs, indicating grains and details within the leaves. When first minted the level of detail to a Liberty nickel is intricate. As the coin wears the finest of lines are first to fade. Grading these nickels is a matter of judging the presence of very fine detail. High in relief and filling the obverse is an Indian with bold lines within the hair and braid extending over the neck. Facial features are rugged, portrayed by bold lines in very high and low relief contours. Highest areas; top of head and cheek are prone to wear and need to remain with luster to reach the mint state grade. Inspect also the feathers at the back of the head. When first minted these feathers are well separate and raised from the hair. A central line within the feathers leads to a tie at the top of the head. A subtle point is found in the area of the date. Tying the hair braid is a cord with one of the ends extending to the date. The dated is high in relief the cord is slightly covered and the shoulder line and braid are well separated and distinctive. 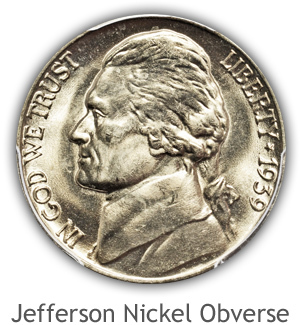 Jefferson's portrait is bold from the field on an uncirculated grade Jefferson nickel. Bold elements are a feature of his hair. Deep lines are found throughout the waves of hair from his forehead, covering the ear and ending tied at the back. Boldly profiled are features of the face. Eyebrows, raised cheek area and a deep contour separating Jefferson's chin from the neckline. A strongly defined knot ties the hair at the back of Jefferson. Clear folds are portrayed of the knot with the ends of the ribbon fully separated from the knot. Collecting Jefferson nickels is focused on the mint state grade. Close judgement when grading is given to confirming the fine details remain on the coin. Monticello, Jefferson's home fills the reverse of these nickels. Given a high profile the building seems to project forward above the surface. Four columns with steps are raised well above the field of the coin. Grading also inspects the framing detail around the windows. High in profile is the triangular roof and dome above the columns. Raised lines define both the roof and dome with arched openings. It is the central area of the reverse first inspected when grading. Columns with defined bases, clear steps and rounded raised lines forming the roof details are all judged for completeness. 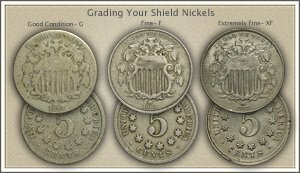 With a well detailed, intricate design, small details become the deciding points to grading the Shield Nickels. Judging the amount of wear in areas as fine as the frame and leaf detail are important to identifying condition. In the Fine grade many details are present, the coin still has a vibrant appearance. Fine condition coins are well received and sought as a collectible. Subtle differences separate the Fine grade to the nicer Extremely Fine grade. Difference in value is large however. Presence of strands of hair, lettering in the cornet and details within the wreath on the reverse are closely examined. Frequently found dates, those in the 1900's are highly prized in the Fine grade and higher. 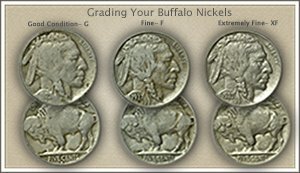 Many Buffalo nickels exist today in very worn condition, graded as good condition, they served a long time. Video and descriptions identify the noticeable features separating a $1 coin from a $10 nickel. Grading these nickels closely and finding a well-defined feather from the hair improvers the appeal to collectors. Key to value is separating the Mint State examples from the worn, circulated coins. First evidence - lose of luster across Jefferson's hair. The video has a close-up view highlighting the points to evaluate. Collectors place a premium on the mint state grade coins. Identifying the full design remains intact is key to this grade. Visit the master index of grading videos. 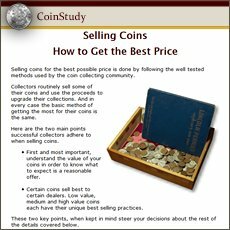 Improve the skills needed to judge condition and determine the value of your old coins. It is not always the combination of date and mintmark raising your old coins to the scarce and valuable level. Often condition or "grade" is the deciding factor in collector appeal. Once condition is judged accurately consult the values chart and discover how much old nickels are worth. Value charts of US coin series reflect the difference in a coin's grade. Combining all of the factors when judged accurately determines desirability and ultimately value.